Glow sticks are a surprisingly hot commodity in the future. A superstrong woman named Vendetta who is immune to radioactivity has been menacing Wayne-Powers deliveries, but only certain ones. At this point in the cartoon Derek Powers had been revealed to everyone to be Blight and seemingly died, his son Paxton Powers having overthrown him to assume control of Wayne-Powers. However, Derek’s secretary, Miss Winston, is trying to keep the legitimate business holdings from being disrupted by the illegal activities Paxton continues from his father’s time, but he isn’t as concerned about what it would do to the company. As she tries to get past him for the sake of the company, which she knows Derek would want protected, she becomes a target of Paxton who tries to have her killed. Except she actually is Vendetta, having been around Derek/Blight long enough that she’s gained powers of her own. Batman (remember him?) is forced to protect Paxton from Vendetta, but she manages to shut down one of the more invasive Paxton operations, to showcase how much Winston is needed to protect Wayne-Powers while Paxton continues his father’s illegal legacy. What they got right: Miss Winston only appears in a few episodes of the series, but using her loyalty and ties to Derek to create a threat for Paxton that Batman still has to deal with is a really good idea. Vendetta makes for a good threat and it’s too bad this is her only appearance and Winston’s last appearance in the DCAU. What they got wrong: She should have been on the show. This actually should have been an episode of the show. 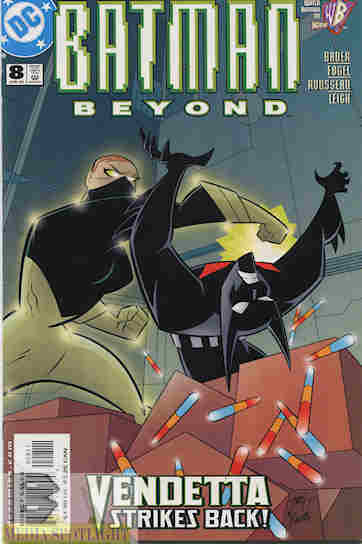 Batman Beyond seems to do better at tying into continuity than the other “Adventures” titles and it’s a shame more of these ideas didn’t move over to the show given how many of the show’s writers worked on it. I’m not sure Winston had to be secretly in love with Derek though. It’s not like Mercy Graves is hot for Lex. At least I don’t think she is. Recommendation: Fans of the show really need to check this issue out and see if I’m right. The rest of you should check it out as well. Posted by ShadowWing Tronix on February 16, 2019 in Animation Spotlight, Television Spotlight, Yesterday's Comics and tagged Batman Beyond, DC animated universe, DC Comics, DCAU, Miss Winston, Paxton Powers, Vendetta.